The innate immune system is crucial to limit viral infections. It relies on several groups of pattern recognition receptors (PRRs) that recognize viral nucleic acids1. These PRRs include the cytosolic DNA sensor (CDS), cyclic GMP-AMP synthase (cGAS), and the cytoplasmic RNA sensor, retinoic acid inducible gene I (RIG-I). Once activated, they induce different signaling pathways leading to the production of a variety of antiviral molecules. Interestingly, evidence suggests that these signaling pathways are tightly interconnected to potentiate the antiviral responses. The sensors cGAS and RIG-I recognize different nucleic acids and signal through distinct adaptors. cGAS senses the aberrant presence and concentration of DNA in the cytosol then recruits stimulator of interferon genes (STING, or MITA/ERIS/MPYS) through the cyclic dinucleotide 2’3’cGAMP2. RIG-I detects viral RNAs that exhibit an uncapped 5’-di/triphosphate end and a short blunt-ended double stranded (ds) portion, then binds to mitochondrial antiviral signaling protein (MAVS, or IPS-1/VISA/Cardif)1. Following their activation, cGAS/STING and RIG-I/MAVS trigger common signaling cascades that lead to the production of type I interferons (IFNs) and pro-inflammatory cytokines. A complex interplay between the RNA and DNA pathways has been reported at different levels. First, several groups have demonstrated that, in human cells but not in mouse cells, cytosolic AT-rich DNA induces type I IFNs in a RIG-I/MAVS-dependent manner3-5. This recognition by RIG-I was shown to require the transcription of poly(dA:dT) by RNA polymerase III4,5, although a direct interaction between RIG-I and dsDNA has also been suggested6. 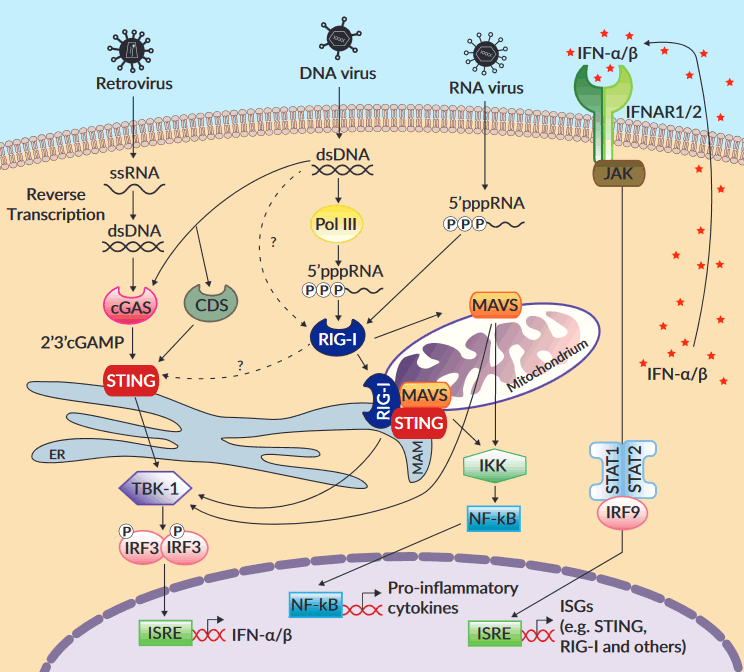 Further, the involvement of STING in the RIG-I/MAVS pathway has been highlighted by the diminished ability of STING-deficient cells to produce type I IFNs in response to cytosolic dsRNA or viral infection and by the direct association of STING and RIG-I in co-immunoprecipitation experiments7,8. These data and others suggest that STING functions as a co-adaptor of activated RIG-I by forming complexes with MAVS at mitochondrial-associated endoplasmic reticulum membranes (MAM)7,9. Additionally, cGAS was shown to participate in the recognition of reverse-transcribed viral RNA10 and cytosolic RNA:DNA hybrids11, and to bind to synthetic RNA in a crystal structure study12. to prevent an excessive immune response14. In conclusion, cGAS/STING and RIG-I/MAVS are physically and functionally interconnected. Crosstalk in RNA and DNA detection and subsequent signaling cascades are critical, not only to cope with the diversity of microbial nucleic acids, but to counteract viral escape mechanisms. Moreover, the interplay between RIG-I and STING may help balancing efficient anti-viral response and cellular integrity. Of note, the RIG-I and STING crosstalks vary greatly among species and cell types, probably reflecting the co-evolution of viruses and their cellular targets. Future development of agonists or inhibitors of the nucleic acid sensing pathways will require scrupulous examination of their impact on each nucleic acid sensor. 1. Gebhardt A. et al., 2017. Discrimination of Self and Non-Self Ribonucleic Acids. Journal of Interferon & Cytokine Research 37: 184-97. 2. Tao J. et al., 2016. cGAS-cGAMP-STING: The three musketeers of cytosolic DNA sensing and signaling. IUBMB Life 68: 858-70. 3. Cheng G. et al., 2007. Double-stranded DNA and double-stranded RNA induce a common antiviral signaling pathway in human cells. Proceedings of the National Academy of Sciences 104: 9035-40. 4. Ablasser A. et al., 2009. RIG-I-dependent sensing of poly(dA:dT) through the induction of an RNA polymerase III-transcribed RNA intermediate. Nat Immunol 10: 1065-72. 5. Chiu Y.-H. et al., 2009. RNA Polymerase III Detects Cytosolic DNA and Induces Type I Interferons through the RIG-I Pathway. Cell 138: 576-91. 6. Choi M.K. et al., 2009. A selective contribution of the RIG-I-like receptor pathway to type I interferon responses activated by cytosolic DNA. Proceedings of the National Academy of Sciences 106: 17870-5. 7. Zhong B. et al., 2008. The Adaptor Protein MITA Links Virus-Sensing Receptors to IRF3 Transcription Factor Activation. Immunity 29: 538-50. 8. Ishikawa H. & Barber GN. 2008. STING is an endoplasmic reticulum adaptor that facilitates innate immune signalling. Nature. 455(7213):674-8. 9. Castanier C. et al., 2010. Mitochondrial dynamics regulate the RIG-I-like receptor antiviral pathway. EMBO reports 11: 133-8. 10. Gao D. et al., 2013. Cyclic GMP-AMP Synthase Is an Innate Immune Sensor of HIV and Other Retroviruses. Science 341: 903-6. 11. Mankan AK. et al., 2014. Cytosolic RNA:DNA hybrids activate the cGAS-STING axis. EMBO J. 33(24):2937-46. 12. Civril F. et al., 2013. Structural mechanism of cytosolic DNA sensing by cGAS. Nature 498: 332-7. 13. Liu Y. et al., 2016. RIG-I-Mediated STING Upregulation Restricts Herpes Simplex Virus 1 Infection. Journal of Virology 90: 9406-19. 14. Wu X. et al., 2017. RIG-I and IL-6 are negative-feedback regulators of STING induced by double-stranded DNA. PLOS ONE 12: e0182961.